These medical plants originated from Sri Lanka, then spread throughout the tropics, including Indonesia and Pacific islands. Gout leaf grows wild in fields, on the riverbank in the yard or planted as living fences and other places to a height + 800 m dpi. 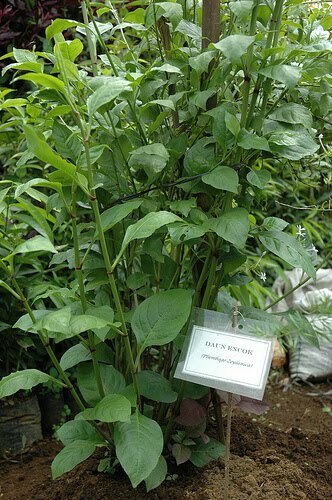 Ascending annual shrub, Trunked length, height 0.6 to 2 m. Woody stems, round, smooth, grooved, bereabang. Leaves single, alternate locations, which comes from 1.5 to 2.5 cm long, somewhat dilated petiole base, hugging the stem. Leaves oval to elliptical, 5-11 cm long, 2-5 cm wide, pointed tip, base obtuse, edges beringgit, pertulangan pinnate, green color. Compound interest in the bunch that came out at the end of the shaft, a small, furry, white. Fruit small, oval, light green, after the old black. Small seeds, brown. PART USED: Root and herb. - Ringworm, and blood cancers. Roots as much as 10-15 g, boiled for more than 4 hours. External use, leaves crushed and then placed on the body are subject to rheumatism, lumbago, bruises, ringworm, leprosy, scabies, sore to the style or placed in the lower abdomen when urinating less smoothly. When using do not squeeze this leaves more than 1 / 2 hours so as not to arise such as burns blisters.